For centuries, man has had a fascination with the eagle. The majestic birds have inspired people through the ages. 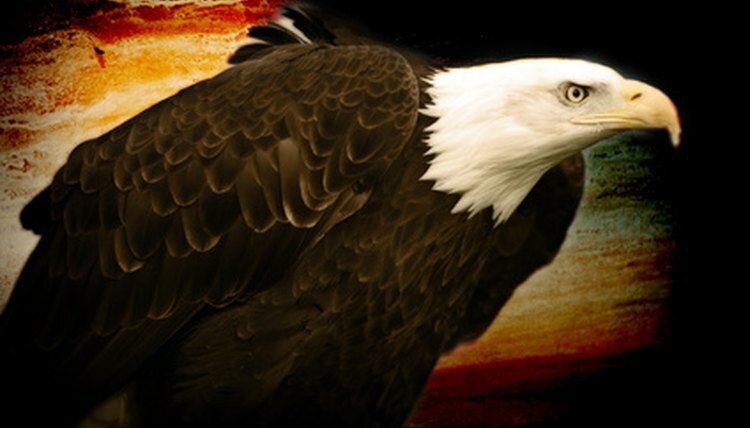 From ancient cave paintings to American money, eagles appear as powerful creatures representing honor, wisdom and power. In nature, eagles have several body parts that help them stay on top of the food chain. From their massive wings to acute eyesight, the 59 eagle species flying over the Earth have developed many ways of staying ahead of their prey and avoiding danger. The eagles' wingspan and size vary from species to species. According to the PBS program "Nature," some of the largest eagles "can weigh more than 20 pounds and have wings that spread 8 feet across." Eagles are notoriously fast fliers, reaching speeds of more than 150 mph while diving for prey. Some eagles have long, broad wings for gliding on air currents while others utilize shorter wingspans and larger tails for maneuvering through dense forests. According to National Geographic, some eagles, including the golden eagle, use their wings "to maintain territories that may be as large as 60 square miles." An eagle's most useful asset may be its talons. These birds of prey rely on their sharp talons to hunt and grip prey such as mice, rabbits and squirrels. Some species of eagles have been known to grab turtles from the ground and drop them from great heights to crack the shell. Some eagles also use their talons for swooping near the water and grabbing fish. The Nature website notes that some of the larger eagles "can kill and carry off prey as large as deer and monkeys." The term "eagle eye" came to be for a reason. According to "Nature," an eagle's eyesight is among the best of any creature known to man. Eagles can spot a small animal of prey from miles away. "Nature" credits eagles' vision capabilities to the size of their eyes, which are "very large in proportion to their heads, are densely packed with sensory cells. While humans typically have 200,000 light-sensitive cells per square millimeter of retina, eagles may have 1 million — five times more." Eagles are also capable of seeing five basic colors, making it easier to spot prey from the air.